With the blessing of the descendants of the relevant donors and his trustees, Graham Beal, the director of the Detroit Institute of Arts (DIA), has had to rob Peter to pay Paul, diverting the interest from acquisitions endowments to balance the museum's budget last year. The unusual move has helped keep the museum in the black at a time when Beal has overseen drastic cuts in expenditure. The museum's operating budget was $34m (2007/08); three years later it was only $24m (a decrease of 29%). Painful decisions and dogged fundraising has kept the museum's situation stable at a time when the state of Michigan's economy, and Detroit's in particular, is reeling. 2009 was the state's worst economic performance in more than half a century, and jobs are only slowly coming back, according to the University of Michigan. In the past decade, Detroit has lost 25% of its population; entire neighbourhoods are empty. Some 20 years ago, Michigan supplied 75% of the DIA's annual budget. Last year it made a one-off grant of $10m for capital costs, however, it could offer only $20,000 towards the museum's operating costs (a sum the museum chose not to apply for). "We thought that other institutions would benefit from such a tiny amount more than the DIA," said a museum spokeswoman. In Detroit itself, the mayor Dave Bing wants to provide what Beal calls "a small but helpful amount" amid his draconian budget cuts, but the city council wants to end funding altogether. The museum, however, raised about $330m between 1999 and 2009 to pay for a major renovation, a modest expansion, and to boost its endowment. The DIA has a small unrestricted endowment, less than $80m, which provides about $3.5m a year to the budget, "if that", Beal said. But it also has several restricted funds that currently generate about $4m a year for acquisitions. With these funds the DIA has been able to steadily add to its collection, while the operating budget has been squeezed. Facing a deficit, Beal approached the trustees of the estate of one benefactor two years ago, asking if the income generated for acquisitions could be diverted to operations. (The original donor may have helped pay the DIA's staff wages during the Depression, the museum believes.) The trustees agreed. Beal also sought permission from probate court. The transfer of the funds became effective 15 months ago. Beal also received permission from another deceased donor's family. He declined to name the benefactors, but said that together the two funds generate around $2m in income a year, and that the agreements will last for five years or $10m in total. "That's $2m a year we don't have to raise over the next five years," he said. Art lawyers say this is all legitimate. The DIA has other acquisitions funds but Beal says they are smaller and not likely to be tapped. He has promised that a new $4m bequest will go to, and stay in, the acquisitions fund. And if somehow the DIA's finances miraculously improve, Beal said he will immediately restore the diverted $2m to its original purpose. 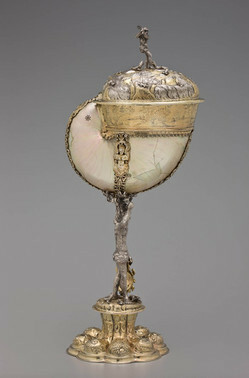 In the past year, among other things, the museum has purchased a nautilus cup made in Nuremberg around 1650; The Concert, painted by Dirck Van Baburen in around 1623, both for prices in the mid six-figures, and On the Nile, painted in 1872 by Sanford Robinson Gifford, for around $1m. It has also bought African and Islamic art.